Cape Town - The Brumbies scored five tries on their way to a convincing 31-20 win over the Lions in Canberra on Saturday. The Lions replied with five-pointers by wing Aphiwe Dyantyi, flyhalf Elton Jantjies and replacement back Sylvian Mahuza. 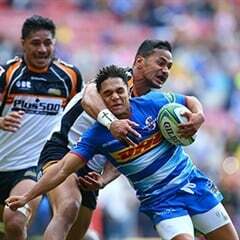 Jantjies also kicked a conversion and a penalty. The Brumbies picked up four points for their victory and moved to third in the Australian Conference and 11th in the Overall log. The Lions, who were coming off a 42-5 hammering at the hands of the Sharks last weekend, left empty-handed and remained fourth in the South African Conference and eighth in the Overall standings. In next weekend's Round 10 action, the Brumbies travel to Cape Town to face the Stormers at Newlands (Saturday, April 20 at 15:05), while the Lions head to New Zealand where a clash with the Chiefs awaits (Friday, April 19 at 09:35 SA time).